Regular blog maintenance routine is a critical and essential task for every professional blogger. It not only keeps your blog in a healthy condition but also keeps you well prepared in advance to tackle any kind of emergency. Some of the routines included in a typical blog maintenance checklist are more or less similar and are done by almost every blogger. I currently manage several niche blogs (for my clients) and a personal blog. The maintenance routine discussed here is more or less the same for all of them. Before we go ahead, I must stress that some of the tasks mentioned here may not be applicable to your blog (hosted platform) and you can safely ignore them. Remember, some of the critical maintenance routines mentioned below should be part of your blogging schedule, without any fail. Failing to do so may lead to the loss of years of hard work. In fact, I'll advise you set a reminder to stick with your blog maintenance routine. Let's get started and learn all the essentials of a good blog maintenance process. Without any doubt, this is one of the most important blog maintenance routines for every blog. Instead of daily backups, I prefer to do it on a weekly basis—mostly at the weekends. If you're publishing a lot of content on a daily basis, you can increase this frequency to suit your needs. I use three different ways to backup all of my clients' blogs. The first one is quite simple that involves the use of a backup plugin to complete the entire task directly from within the dashboard. The other two techniques are tree replication and cross-server replication which I'll only recommend if you're technically sound. This helps me keep the blog's data on three different physical locations. In the event of any mishap, my first option will be to use the tree replicated on the local server as it will help me restore the blog—very quickly. The second-best option is the backup lying on a different server and the last resort is the backup lying on a cloud storage earlier pushed via a plugin. This is often ignored by a good number of bloggers that results in bad visitors' experience. If the number of broken links is high, it may also affect your search engine presence. I analyze these dead links in the first week of every month. Since I do it every month, the number of broken links detected are low and it doesn't take much time to fix each of these links. Instead of using a plugin, I use this powerful tool to find all broken and non-functional links on my blog. Yes, it's not just the non-existent links that need to be fixed, but you must also deal with non-functional links—as well. A typical non-functional link simply hangs and doesn't open for a long time. For both types of links, I either remove it altogether or replace/redirect it with a different and relevant link. Every 3 months or so, I head over to my archives for various reasons. One of the reasons is to continue my internal deep-linking effort to facilitate better inter-post navigation. The second reason to traverse all the old directories is to improve and update non-performing content. Make no mistake about it; archive optimization can improve your blog by leaps and bounds. The time spent on this optimization activity is totally worth it. If you're not doing it on your blog, try it once—and see the difference. If you're not posting on a regular basis, you can extend this optimization interval to twice a year. If your archive is extremely large, you can target each category—every month. This is an important and critical exercise (from SEO perspective) to get more out of your blog. Here, I'm talking about web page elements and content sections that must be audited and optimized for better results. A common example is your blog's sidebar. That's the first content section under my radar while optimizing different sections. You should be comfortable with at least one web analytics program to correctly assess the performance of various content sections of your blog. Recently, I've updated the design of this blog and added some key content sections based on my research from the data I got through Google Analytics. I've revamped my sidebar, footer, and the home page as well to include some important sections that were non-existent before. Pro Tip: Make sure your blog is search engine optimized from the core—right from day one. I'm already experiencing positive results both in terms of better subscription rate and the number of leads I used to get earlier. Remember, although I've mentioned that I do this quarterly, it doesn't mean that I change different content sections—every 3 months. I simply assess their performance and, if needed, I go ahead with the change. I use both affiliate and pay-per-click advertisements on all of my niche blogs. Now the question arises—what blog maintenance has to do with these ads? Although ad optimization is not strictly part of a typical blog maintenance routine, still I prefer to keep it under this list. Quite similar to the optimization of select content sections on a blog, ads optimization ensure your blog is giving you the returns—to its full potential. I regularly (almost every month) analyze the performance of my PPC ads and make the necessary changes, accordingly. I also use URL tagging for select affiliate links to assess their performance. You can also tag key page links to monitor visitors' activity on them. It's not just tagging but the change of creatives and their placements should be done—preiodically. Almost every WordPress blog is a target of spammers. If not taken care of, these unwanted intruders can pile up a mountain of garbage content on your website. So, right from day one, create a deterrence for the spammers. And, the best way to do it is to use a powerful and effective anti-spam plugin. Try and test all the popular options and stick with the one that gives you the—best results. Unless a lot of legit comments get trapped in a spam queue, I'll recommend automating the spam cleaning process. Else, you must go ahead with the manual approach. It's not just the regular spam comments on posts but spam submissions via contact forms is also a source of a headache. Use a good CAPTCHA plugin to protect all your web forms from the spammers. Experts always suggest keeping your blog's CMS and its components up-to-date to avoid any kind of security issues. If you're using WordPress as your blogging CMS, you'll be dealing with three kinds of updates on a regular basis viz., plugin, theme, and core updates. Pro Tip: Make it a habit to take a blog backup before starting the—update process. By default, minor core updates are triggered automatically. If you're not comfortable with it, disable all kinds of automated updates to switch to the manual approach. Use the following directive for the same and add it to the wp-config.php file. Technically sound users can use a CLI tool to manage updates and miscellaneous maintenance routines. With the passage of time, your WordPress database accumulates lots of redundant as well as some unused meta-data associated with your content. To reduce accumulation of redundant and useless data within the database, you can disable post revisions. Use the following directive within the wp-config.php file to completely disable post revisions. This will help you keep your database size in control as more and more content piles up in your archives. MySQL and its derivatives (e.g. MariaDB) inherently support database optimization options which repairs and optimizes tables in your WordPress database. You can do this in two different ways. You can either use a database optimization plugin or you can use phpMyAdmin web interface to do it manually. Depending on the amount of database activity of your blog, you can increase or decrease the frequency of this database optimization process. 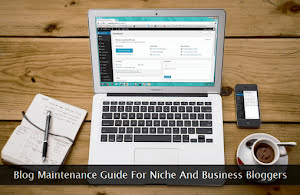 Apart from these core maintenance routines, there are several other important tasks that come under a typical blog maintenance schedule. Depending on the type of blog and the entire setup, you may not be using all of the routines mentioned in the list below. Check your blog feed every week to find out whether it's functioning correctly as expected or not. If you're offering multiple feeds to your subscribers, regular checkup of all of the feeds is essential to avoid complains from your subscribers. Once a month, check all kinds of web forms present on your blog. The best way to test them is to provide a dummy submission for each of these forms. You must also test them in the latest versions of all the major web browsers to check whether they're rendering correctly or not. Monitor and optimize all of your squeeze pages (if any) every quarter. This also includes other important pages like your “About”, “Contact”, and “Archives” page. Once a month, do general blog health checkups related to DNS lookup, ping and page load times. You can use a specialized tool to perform all these tests—very easily.